Offers and food-deals are part of a restaurant business. A restaurateur can introduce offers to its customers at any point on his business cycle : when he is starting his restaurant business, in addition to his existing menu, and even when his restaurant is well-established. Offers are also given on special occasions such as the Independance Day, Halloween’s Festival, St. Patrick’s Day, Mother’s Day,Thanksgiving Day, Christmas, New Year’s and several others. Offers and food-deals are given to serve multiple business objectives. For many years, the Quick Service Restaurants in particular kept asking themselves ,are my customers getting value for their money ? What more can I offer to make them come to my restaurant again and again, and yet maintain a decent margin ? The other side of course, is the pricing. And one has to be careful at this since frequent offers and discounts usually erode profit margins in the short-run. As a restaurateur my thought process on offers may be : If I price my burger at $6.00 with a 20% margin, then sales of 100 units would fetch me a profit of $120. With this amount at hand, can I additionally offer four pieces of chicken wings costing 50c apiece, as an early bird incentive to the first 20 customers ? Alternatively, can I offer a 300 litre of a Canned Coke costing 75c along with the burger ? The customer too is looking for the freebies and the combos. Anything offered gratis, complimentary or at a discount is immediately grabbed upon. There are also offers, combos or add-ons where the price tag is marginally higher, say $3.00. Most don’t mind paying up. In the end it’s the pleasure of eating that counts ! 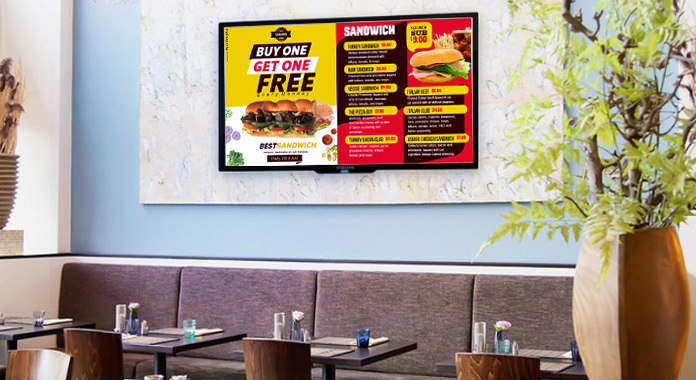 Best Aesthetics For Offers :- The digital menu board can be adorned with superbly created visuals , videos and playlists of the food Offers along with a catchy caption and content. Has great impact. Flying customers come in, avail of the offers and increase the sales. Provides For Working Capital Quickly :- The Foods business is a dynamic one and the restaurateur is seeking to have money at hand consistently to rotate his stock/supplies. Therefore, the offers and schemes facilitate quick sales and turn-over of stocks. Enhances Sales Volume :- Most QSR’s today make their margins on volumes. And the offers and add-ons provide an impetus in sales and increases the volume ( per-unit sales of the items). Usually it is : more customers,more volume. Hence, the need for offers. Increases Profit Margins :- This happens in the long run. The offers have an impact in increasing the customer base and customer loyalty, over time. And with this increase, the restaurateur may expand his business, add new items, conceive fresh pricing strategy etc. Combats Competition ;- Without doubt. Good offers, discounts and freebies can decimate competition. You need to be careful on pricing though. Glittering digital menu boards with great visuals, content and design should do the trick. Facilitates Branding :- No better way to brand your restaurant than with best food deals. Name your burgers and pizzas, your schemes, your discount offers. Catchy names, which people can remember. And they will come back to you. Again and again. Attractive Ambiance :- This goes hand-in-hand with food offers. If you want your customer to spend more time in your restaurant, you need to provide him an ambiance he would like. Music, air-conditioning, good staff, friendly waiters etc. Ensure that the basics are in order. Induces Loyalty :- When your restaurant is known for great food offers and a superb food quality, popularity and success become inevitable. Conceive a system to update your customer base regularly. Introduce A New Item :- Along with your regulars you can introduce a new item and offer it as an add-on, or at a discount ,as a pilot project and gauge customer reactions. This way, you can experiment on your menu and synchronize with customer preferences in your locality. Food Offer Integration With Social Media And Digital Platforms :- the more people you reach at least cost, the more is the potential of your target customers hooking on to you. After all, customers too like to be pampered , and your posts and offers on his smart phone or the facebook page will give them a feel-good factor in advance.